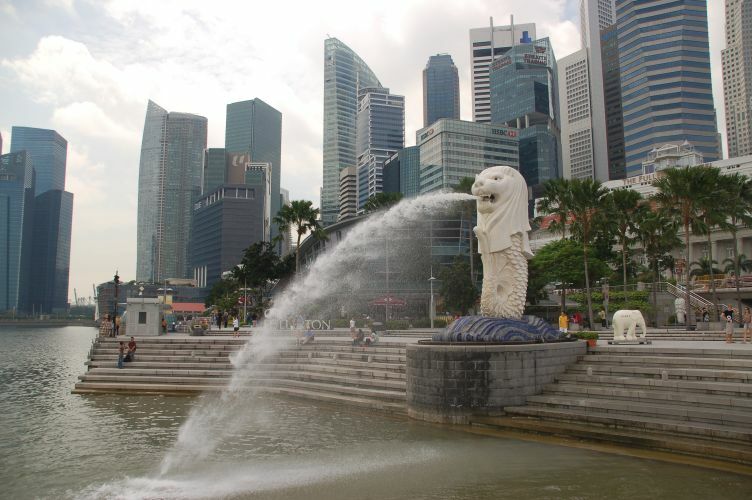 The Merlion is located at the mouth of the Singapore River, which now opens out into Marina Bay Reservoir. 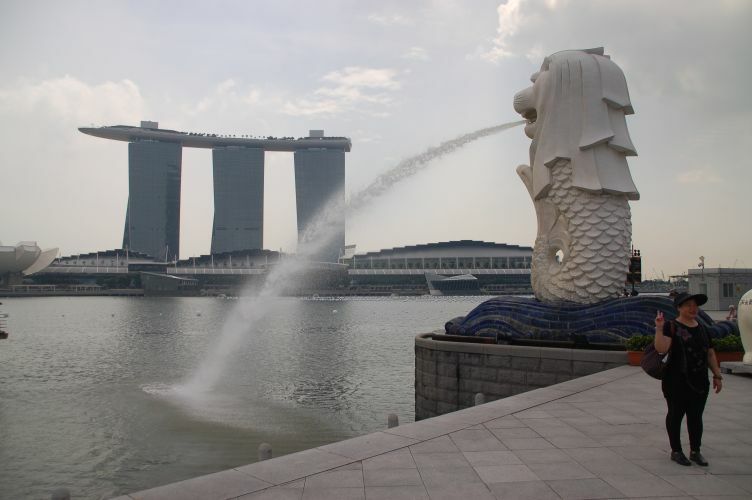 The Merlion is located at the mouth of the Singapore River, which now opens out into Marina Bay Reservoir, on the opposite side is Marina Bay Sands resort complex. The approach to Changi Airport via air gives dramatic views of the resort. 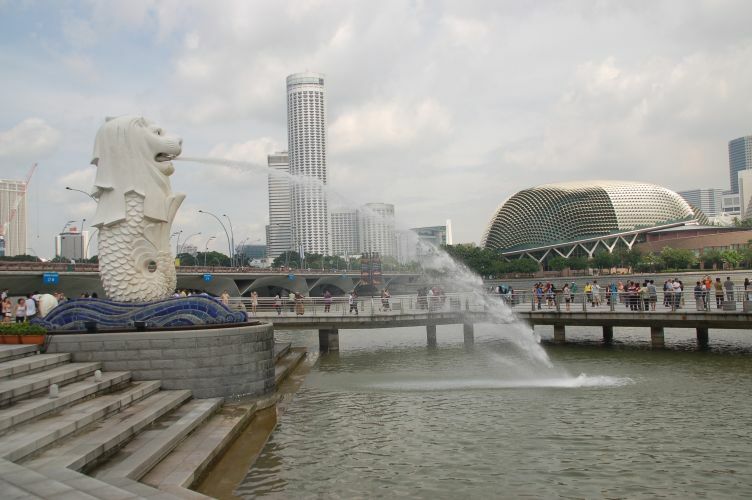 The Merlion is located at the mouth of the Singapore River, which now opens out into Marina Bay Reservoir. The west side is dominated by the skyscrapers of the financial district. 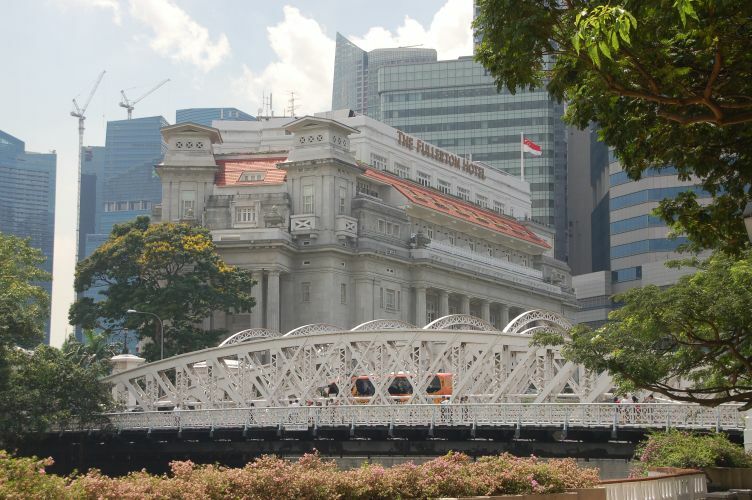 The Connaught Bridge spans the Singapore River linking the Colonial District with the Financial centre. 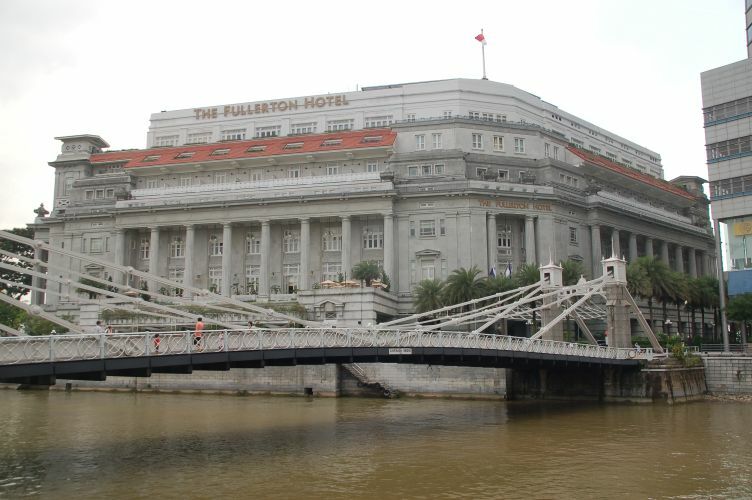 The bridge and the Fullerton Hotel provide the historic link to Singapore of old. 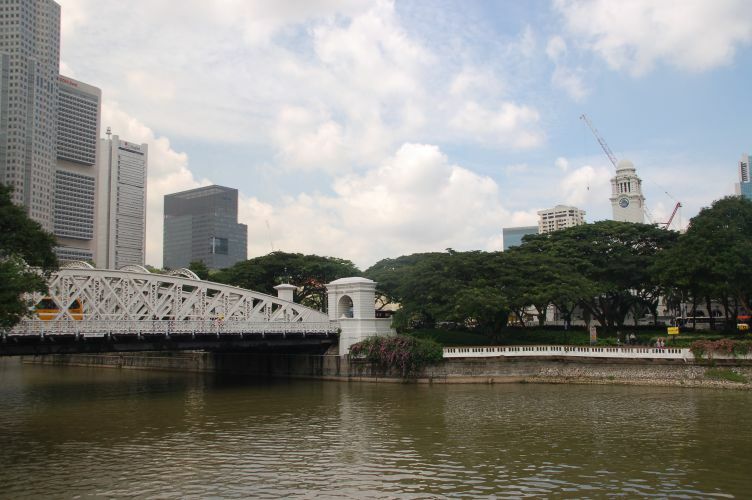 The Connaught Bridge spans the Singapore River linking the Colonial District with the Financial centre. 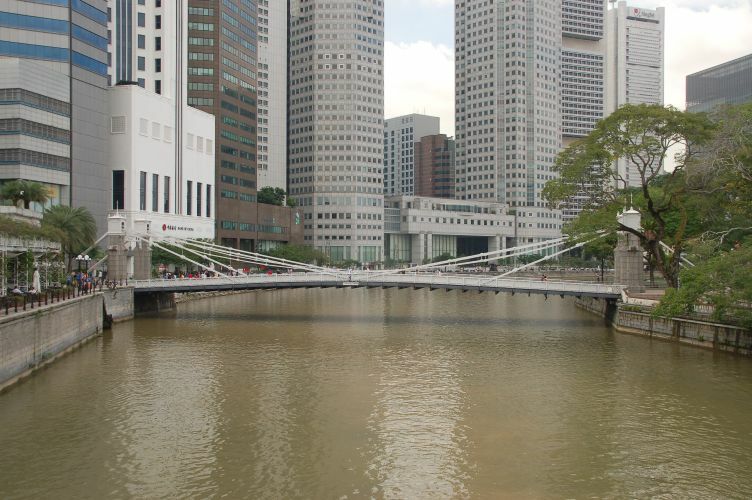 The Cavenagh Bridge spans the Singapore River linking the Colonial District with the Financial centre. 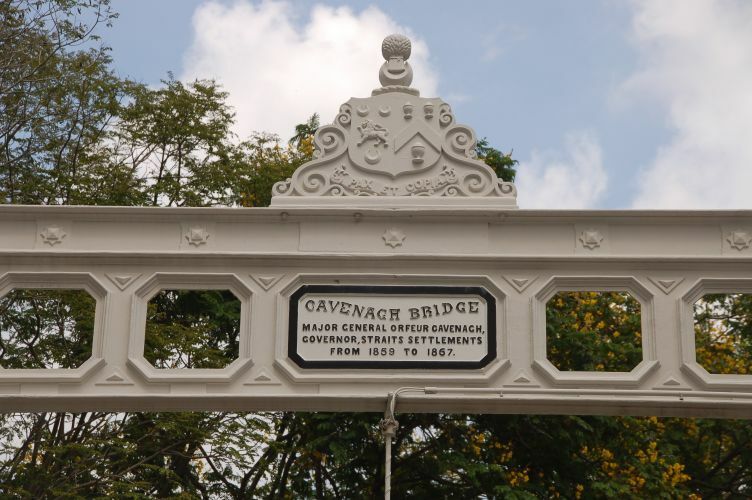 The Cavenagh Bridge is now pedestrianised, although in it days as a main thoroughfare, there were walkways on either side. Like many structures found in the Commonwealth, they originated in the industrial heartlands of the Great Britain, such as Glasgow. 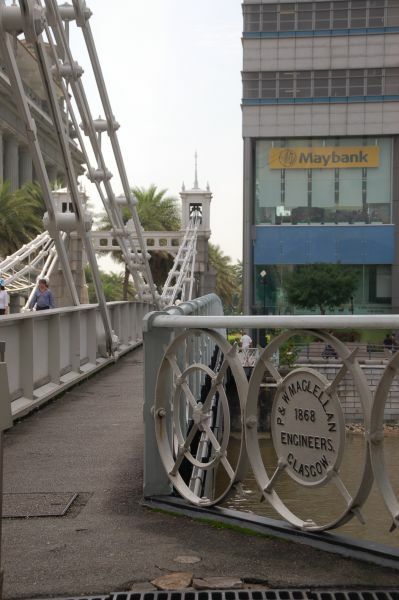 The Cavenagh Bridge is named after a former Governor, Straits Settlements, and a dedication is included on the cross-braces. 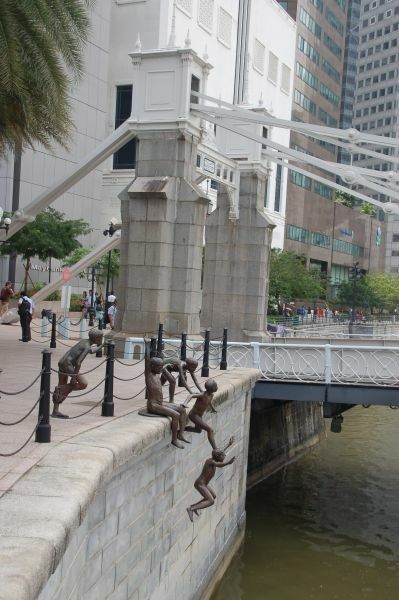 On the west bank of the Singapore River just by the Cavenagh Bridge is a nice bronze sculpture of boys jumping into the river. 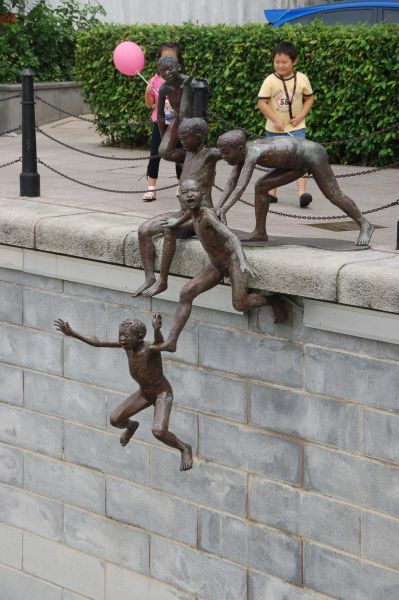 On both sides of the river there are a number of sculptures to provide interest. 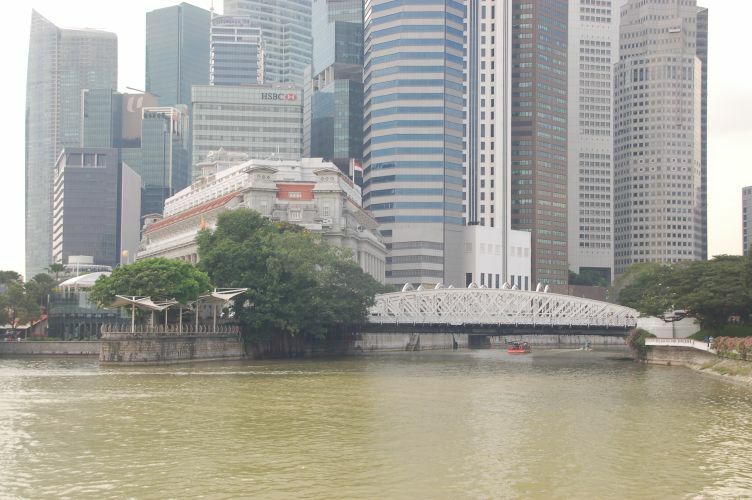 The Cavenagh Bridge viewed from the east bank of the Singapore River. 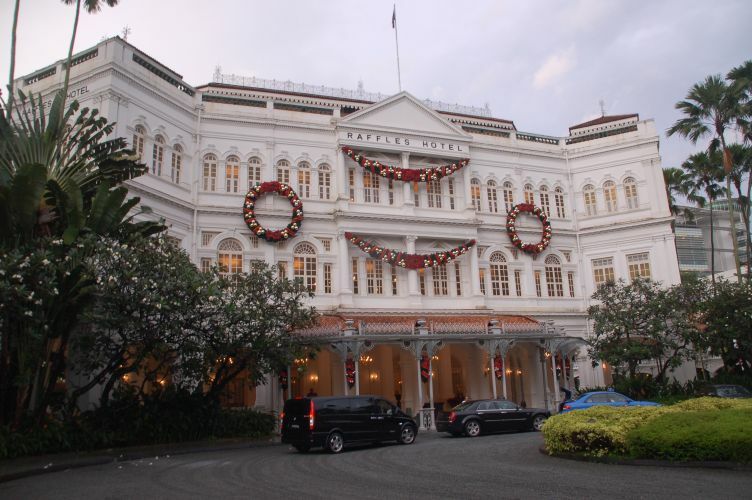 Its a shame about the modern building on the right, remove that and the Singapore flag and you might have a photo from Colonial days. 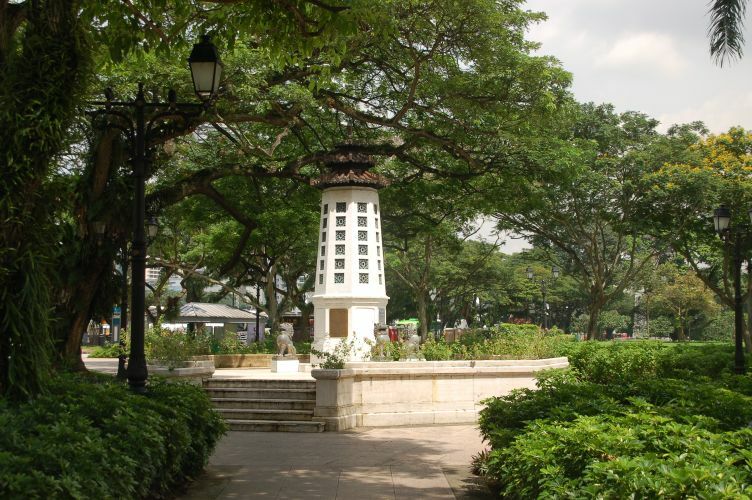 The Lim Bo Seng Memorial in Esplanade Park, on the east/north bank of the Singapore River. Lim Bo Seng in addition to being a resistance fighter in the Second World War, he also was involved in anti Japanese activities when China was invaded by Japan in 1937. For more details ask your friend Google. 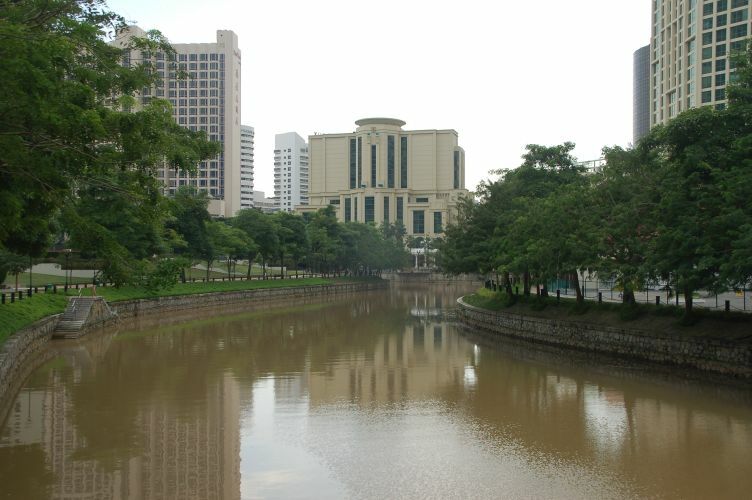 The east bank of the Singapore River is where the Colonial District is found. 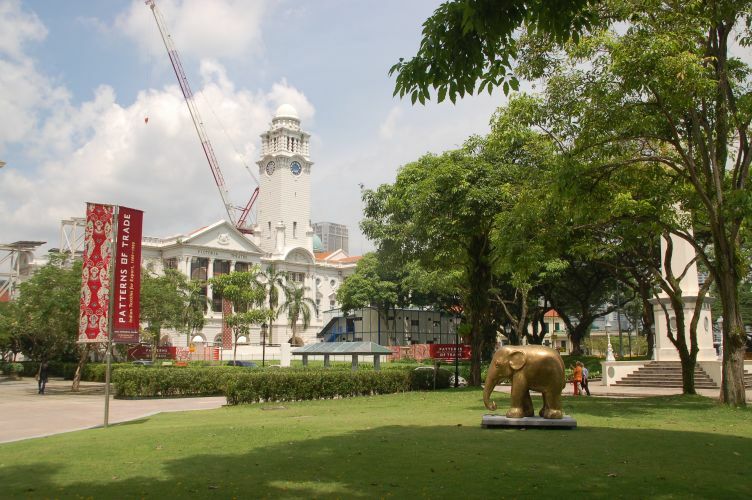 Empress Place Building was completed in 1865 and was first used as a court house, and then Registry of Births and Deaths, The Immigration Department, before becoming one of the two wings of the Asian Civilisation Museum. 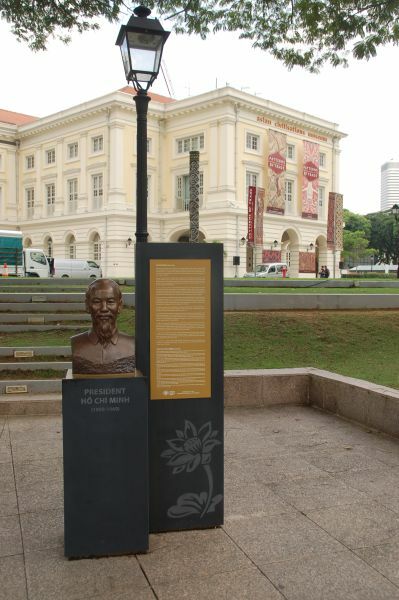 Along the east bank of the Singapore River by the Asian Civilisation Museum, are a number of busts of key figures in Asian Civilisation. 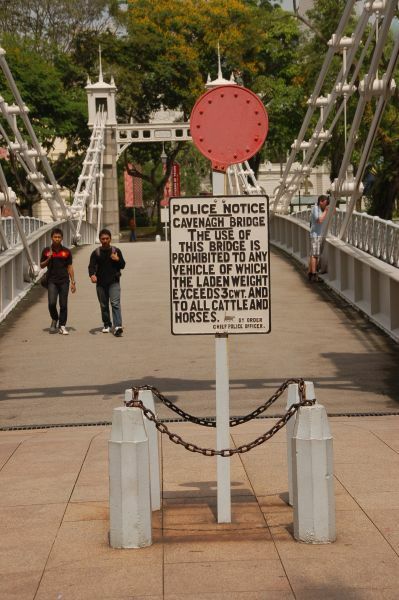 This part of the river bank is where Raffles first landed in Singapore. 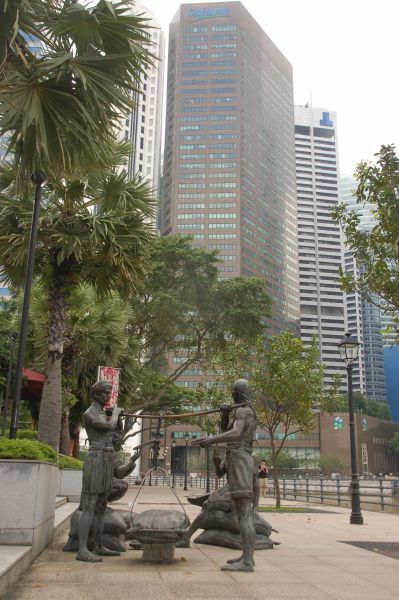 On the west bank there is a sculpture depicting early trade. 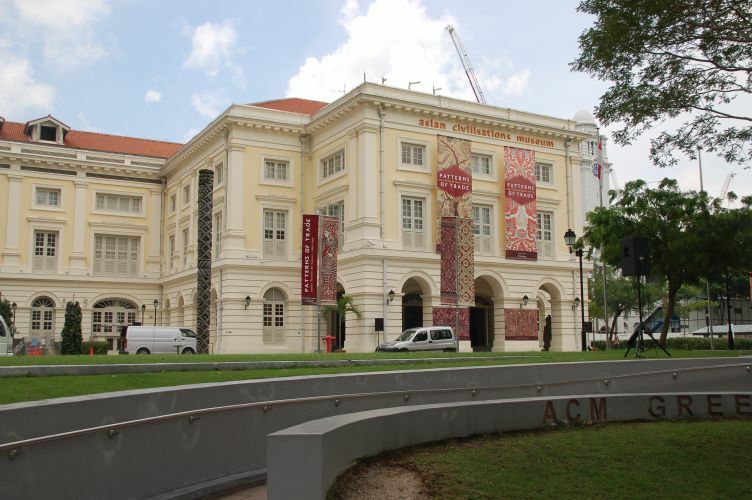 The "Flying Saucer" is The Singapore Academy of Law. The Gothic Dome is the Supreme Court Building, In front are the Parliament buildings, old to the right and new to the left. 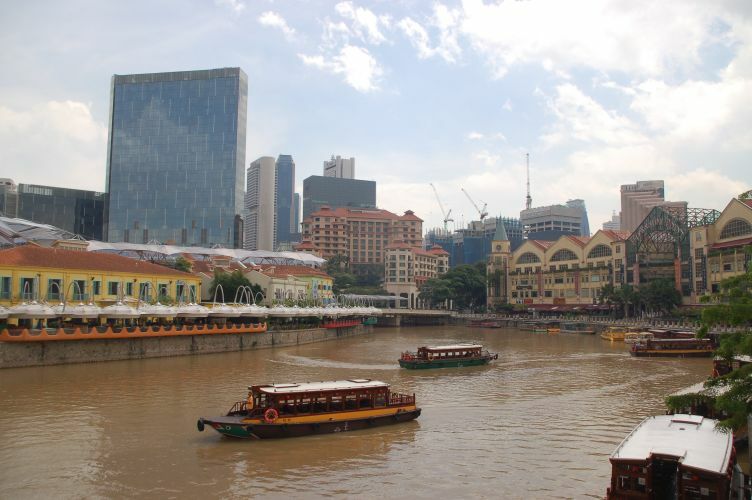 Numerous river boats are seen here, they are working boats in being water taxis or tourist boats, unlike the working boats I saw in 1983 which were best described as "lighters"
The Singapore River is short, after a mile or so it morphs into a canal at Kim Seng Road Bridge. 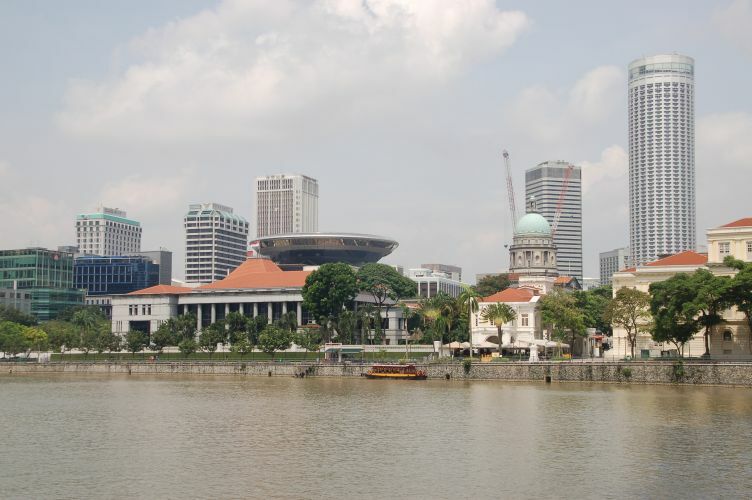 The building in the centre is the King Centre (I think), with view taken from near Jiak Kim Street bridge.